Learning about place value enables children to confidently deal with larger numbers. This is an important skill for children to develop and it will help them throughout their maths education. 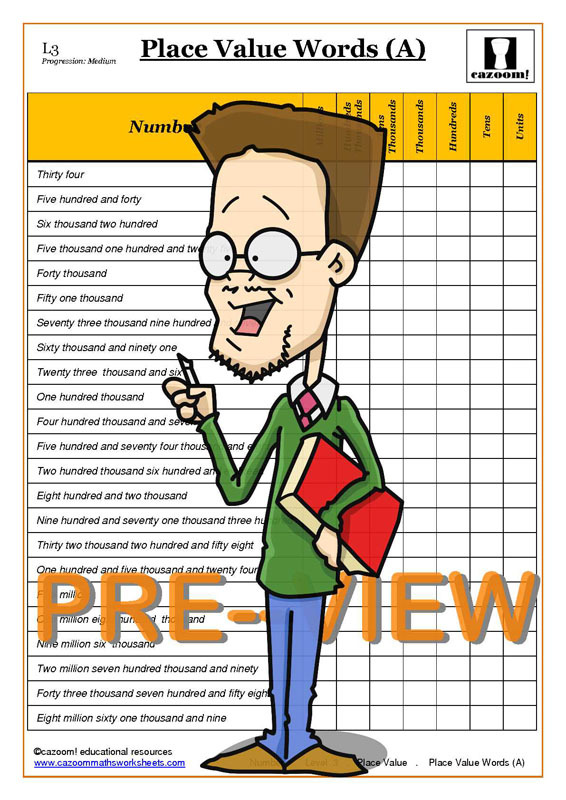 Our place value worksheets are aimed at KS3 students, and cover a range of questions from word problems involving place value, to fun activities on writing cheques. We have a wealth of resources to help primary and secondary school children learn about place value, and a variety of questions for them to practice their skills. 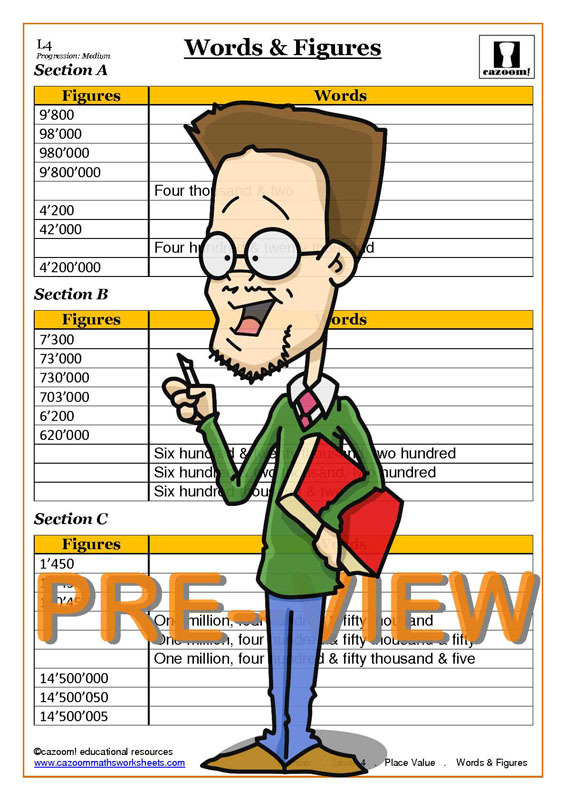 All of our place value worksheets are in PDF format, meaning they can be easily downloaded and printed. 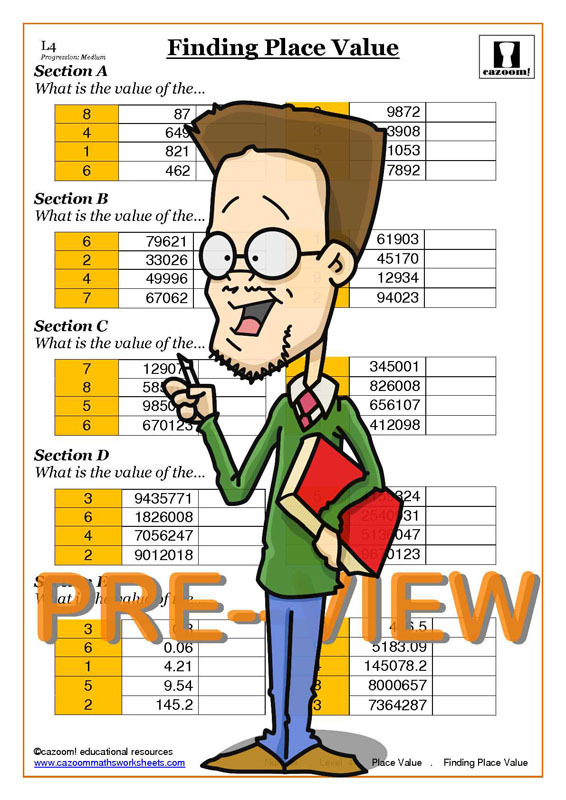 The place value resources available through Cazoom Maths introduce children to larger numbers in an entertaining and enjoyable way, and help boost their confidence with numbers. 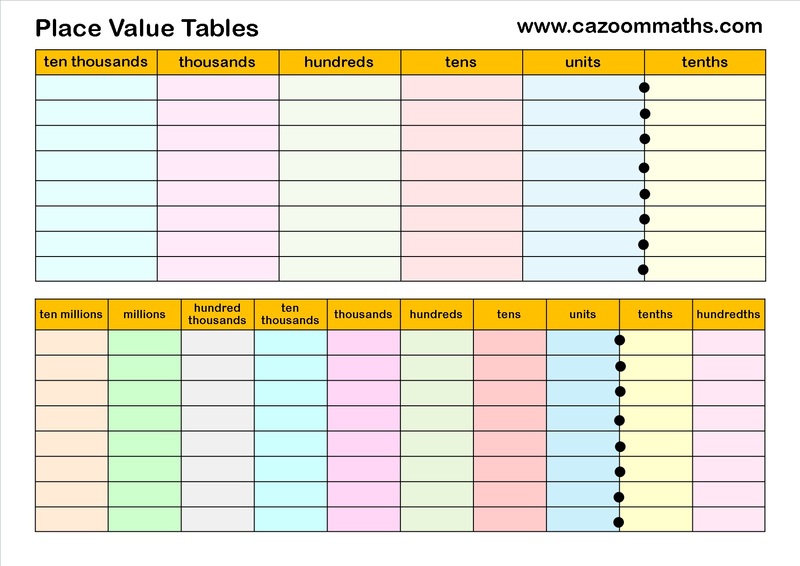 Our place value resources can be used throughout their primary and secondary education: we have worksheets to help children convert words to digits, activities which introduce the place value of decimals, and more place value questions to download. Place value helps a child distinguish between their £10 pocket money and the £100 toy they spotted in a shop. Understanding place value is a valuable skill for children to learn, and it is one which they will need throughout their education. It is a system by which we can understand what a number means, enabling us to perform addition, subtraction, multiplication and division. Students who have only a basic grasp on place value often struggle to perform sums with multi digit numbers, which can knock their confidence in maths. 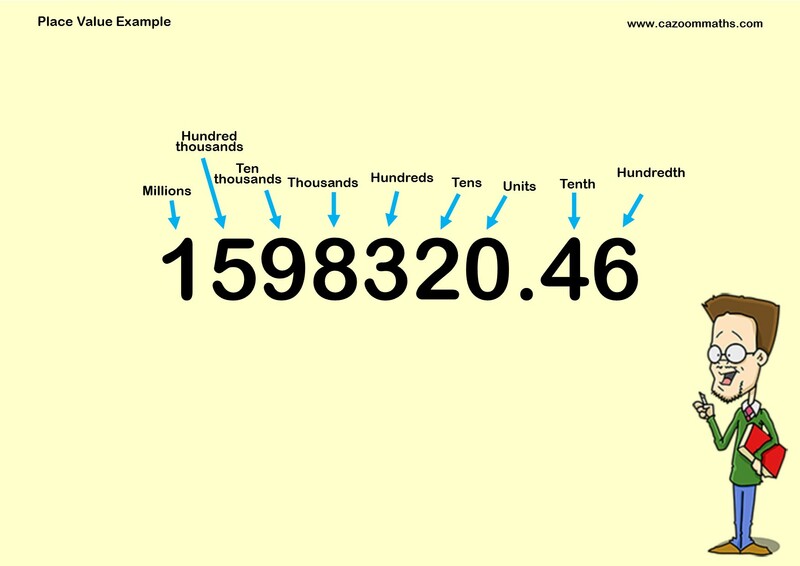 Place value is one of the most fundamental elements of the maths curriculum; it is the foundation for learning about decimals, multiple digit multiplication, and standard form notation. Knowing how place value works reduces the likelihood of students making errors in maths questions, especially when they are dealing with larger numbers. Learning about place value helps children understand how to name numbers. 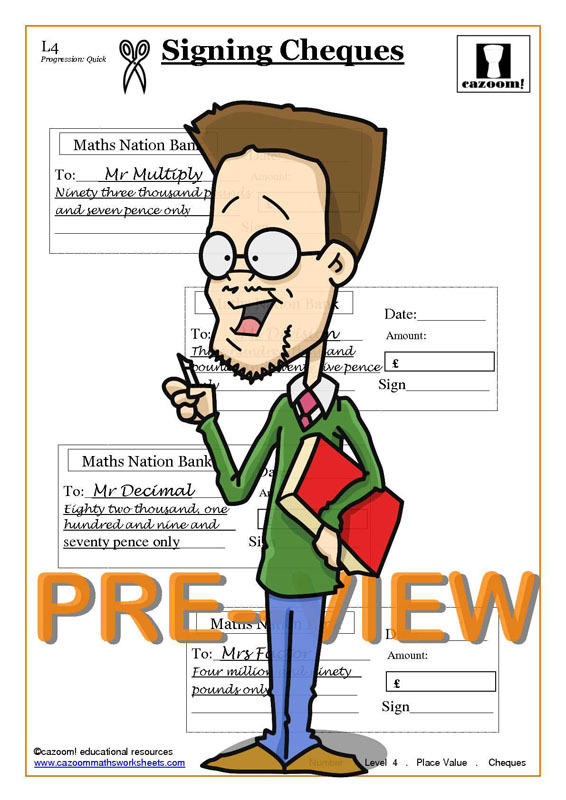 Although cheques are less common now, on a cheque it is necessary to write out the full name for a number to ensure that the correct amount of money is paid, and it is knowledge of place value which will enable someone to do this. Place value worksheets provide a way for children to practice using digits and words to represent numbers, and master this important skill which they will use for life.